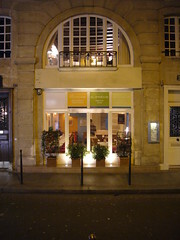 I came across this charming Marais restaurant while searching for a much needed Falafel dinner. While I didn’t have time that night to try this restaurant, it is at the top of my to-eat list. La Victoire has everything a vegetarian in Paris wants. Their menu (.pdf) is filled with the French standards as well as creative veggie variations on the meat-filled plates filling every other restaurant in the city. The location is on a quiet street near Hôtel de Ville. It is bright, cheery, and full of great expectations. The restaurant also has an air of vegan-superiority wit. Be sure to grab a few of their postcards on the way out. Your Meat Eating Friends will appreciate them. I had a chance tonight to stop off at La Victoire. I was craving some soup and new this place would have a selection of vegetarian soups. There are some really great things about this restaurant. But there’s one downside that keeps me from giving it my full blessings. I think the perfect vegetarian restaurant shouldn’t taste of compromises. The food should be super tasty, just without the animal products. For the most part, this restaurant succeeds. I had plenty of tasty bites. Unfortunately, this restaurant also slipped into this trap. 1. Free wifi – woo hoo! I am able to update this blog while sitting in the restaurant. I don’t have to worry about forgetting the flavors. It’s also quiet, comfortable, and restful. 2. Onion confit – Their sweet confit of onions is served with a mushroom terrine. It tastes like a marriage between lotus-flower honey and softly cooked onions. It outshined its compadre, the mushroom terrine, which was flavorful but had no texture. 3. Tarte chocolate with pralines – The chocolate part of this tart is great. It’s rich and satisfying. Unfortunately, the crust is a bit hard, in fact a chunk went flying off the table as I was trying to cut it. It also begs for some creme anglais. It’s still a tasty dessert that any chocolate lover will appreciate. 1. The bread: Why oh why in this city of amazing bread does a restaurant have to serve dry, whole-grained bread. There has to be a better recipe. This bread would have been great in New Mexico, but not Paris. This is the kind of compromise that makes your meat eating friends refuse to return. Give us some darn good bread that just happens to have whole grains. 2. 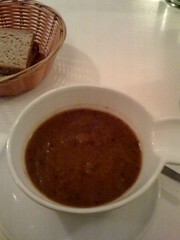 Eggplant, tomato soup. It was good, warm, and filling. It just didn’t knock me out. That’s not such a bad list. I will return to La Victoire. It’s in a great location in the Marais. It is affordable, the people are friendly, and they have a wonderful selection of food and drinks. It’s a small oasis of veggie goodness in the middle of Paris. Now, if they could only get some better bread. I decided to stop by tonight for some soup. I am happy to say they ditched the bread and replaced it with the standard “Poilane” slices. This is a big improvement. I also had a pumpkin/coconut milk soup (it was better than it sounds) and a Veggie burger with fries and a salad. The salad was salty, the fries were ok, but the veggie burger was great. Suprême du Coeur has changed. It is no longer a vegetarian/vegan restaurant. It now serves all types of French cuisine. Fortunately it still has some vegetarian options on the menu. Veggiest Wants You to Celebrate World Vegetarian Week!